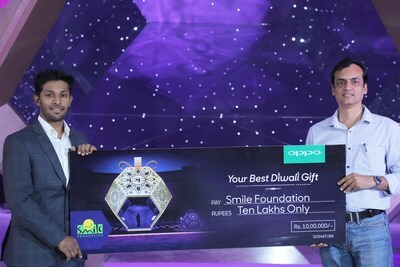 OPPO, The Selfie Expert, recently launched its Diwali Campaign 'Your Best Diwali Gift' starring the recently launched OPPO F9 Pro Starry Purple and highlighting the joy of sharing with the under privileged. The campaign aims to establish an emotional connect with its audience and encourage an alternative way of celebrating Diwali by sharing lights, colors and lots of love with a group of special children. It positions the F9 Pro Starry Purple with its charming design as the best Diwali gift this season of gifting. Speaking on the campaign, Mr. Will Yang, Brand Director, OPPO India, said, "Festivals in India are an exciting time where families and friends reconnect and bond over gifts, lights and sweets. At OPPO, we want to make this experience joyous for all our consumers and are delighted to launch our Diwali campaign. With this campaign, we aim to do our bit and spread happiness amongst the community. We are thankful to Smile Foundation to be our partner in achieving the same. We are focused towards offering our consumers the best of technology, art and innovation this Diwali and believe the F9 Pro Starry Purple will become the best Diwali Gift this year." Under the campaign executed both offline and online, OPPO partnered with the Smile Foundation, a non-governmental organization that works for the welfare of children, their families, and the community and donated INR 10 lakh for a noble cause - providing support for underprivileged children's health - with a special focus on the girl child. A beautiful product experience zone in the shape of a giant gift box was set up at Pacific Mall, Subhash Nagar, New Delhi, enabling consumers to experience the OPPO F9 Pro and light a lamp. Visitors who lit the lamp at the zone contributed towards the noble cause and did their bit in bringing a smile on an innocent child's face. In the second leg of the campaign, OPPO launched a digital campaign highlighting core competency of F9 Pro Starry Purple - "5-minute charge, 2-hour talk". Directed by Mohit Suri, a seasoned Bollywood Director, and starring Kiara Advani, popular Bollywood actress, the video campaign celebrates the bond between a mother and an adopted daughter. It showcases how love connects people and is not defined by blood relations and positions the F9 Pro Starry Purple as the best gift to capture precious memories. The digital campaign designed by Havas India showcases a young girl, played by Kiara, busy helping her mother prepare for Diwali festivities while the family discusses the tough decision of revealing the truth of her adoption. The TVC takes an emotional turn when the young girl goes back to the orphanage which her family would visit with gifts every Diwali, and where they found her. The emotional tone continues as the girl surprises her family by knowing all along, thanking them for being there for her by gifting them a brand a new OPPO F9 Pro. OPPO is a leading global smartphone brand, dedicated to providing products infused with art and innovative technology. Based on the brand elements of young, trend-setting and beauty, OPPO brings consumers delighted experience of digital life. For the last 10 years, OPPO has been focusing on manufacturing camera phones, while innovating mobile photography technology breakthroughs. OPPO started the era of Selfie beautification and was the first brand to launch smartphones with 5MP and 16MP front cameras. OPPO was also the first brand to introduce the motorized rotating camera, the Ultra HD feature, 5x Dual Camera Zoom technology. OPPO's Selfie Expert F series launched in 2016 drove a Selfie trend in the smartphone industry. In 2017, OPPO was ranked as the number 4 smartphone brand globally, according to IDC. OPPO's business has covered 30 countries and regions, and has 6 research centers worldwide, providing excellent smartphone photography experience to more and more young people around the world. More recently with the launch of Find X in 2018, OPPO introduced panoramic arc design with a screen ratio of 93.8%, the largest screen-to-body ratio in the mobile phone market today.